BLINKY BILL THE MOVIE! (DVD Artwork). ©Shout! Kids. HOLLYWOOD—Actor Ryan Kwanten, best known for playing Jason Stackhouse on HBO’s “True Blood,” is Australian and grew up with the “Blinky Bill” books and cartoons. Now audiences worldwide can enjoy cute, adventurous koala Blinky, voiced by Kwanten, in “Blinky Bill: The Movie” due to arrive in theaters Friday, Oct. 7, and available on Blu-ray, DVD and On Demand, Tuesday, Oct. 11. Kwanten reveals that in Australia Blinky Bill is as popular as Mickey Mouse is here; sort of a national icon since the 1930’s. Calling from Bulgaria where he is working on the film “Category Five,” about a heist during a hurricane, Kwanten spoke about what Blinky meant to him and his desire to get young people away from social media screens and back into the real world, taking outside adventures like the one Blinky goes on in the film with his journey into the dangerous Outback in search of his missing father. Q: You did a guest voice for TV’s “Jake and the Neverland Pirates” and voiced an owl in “Legend of the Guardians.” How, recording-wise, is this film different? Kwanten: Well, it was different this time in that (I was voicing) a character that is embedded in my history as well as other Australians from generation to generation. There was a certain onus to do justice to the story and to the character. Fictional as it is, it’s still a part of a lot of Australians’ lives. I didn’t want to disappoint anyone. Fortunately the script really helped us out and you can tell by the quality of high caliber actors that we had (people like Toni Collette, Rufus Sewell, David Wenham etc.) that I wasn’t the only one who thought that. 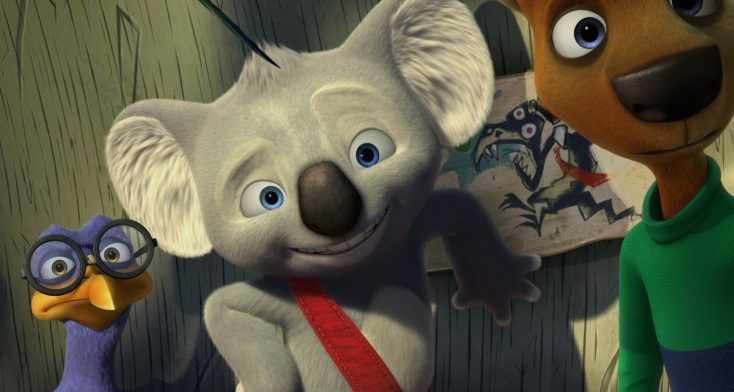 Outside of that, how often do you get the chance to voice a koala? Also, it was the first time in a long time I was able to use my Aussie accent. Q: So I gather that the Blinky books were a part of your childhood? Q: What is it about the Blinky character that is so endearing (besides that he’s cute)? Is it his sense of adventure? Kwanten: I think it’s that eternal sense of adventure. He’s always looking for that. That’s something that’s gotten sapped out of society a little bit when you see kids that are almost too adept at the tech world and not getting out there experiencing the world as much. I think that this is a better time for Blinky than perhaps some of the previous generations because of where we’re heading. I think kids can discover something in Blinky that maybe is lying dormant in them and waiting to get out there in the world. Q: Well said. You lived in Sydney but did you ever get to the Outback for adventures as a kid? Kwanten: Oh yeah. We were that camping family. At early ages, we would get away almost every weekend and just camp with a bunch of friends or sometimes just the family. I’m getting back into it now. I’m amazed at how many Australians haven’t explored their own country. We always think of going overseas first. It’s like a rite of passage; book a one-way ticket somewhere and try to find your way back. Q: Was there an animated feature film that made a big impression on you as a kid or teen? Kwanten: I always liked “Who Framed Roger Rabbit.” When you amalgamate the live action and the animation it transcended everything else I saw then. I was between 10 and 13 I think and I also liked “Inspector Gadget” with Matthew Broderick. Q: Where do you stand on the koala issue? Do you think they just belong in the wild or if they are more endangered and their habitats are shrinking, should we keep more of them in zoos for safety if nothing else? Kwanten: I think it’s a sad state of affairs in general that we’re turning a lot of the world into a bit of a concrete jungle. A lot of the native plants and animals are getting pushed further out and they are driven into habitats that they’re not comfortable or most natural in. On that front we’ve only got ourselves to blame. There are some wildfires (in Australia) that are natural but that’s a tough question. You would love to save them all but don’t know how we could do that. The Taronga Park Zoo in Sydney has a great breeding program to protect the animals. Q: How did you find your inner koala? Did you grow up watching them a lot? Kwanten: Yeah. Honestly, I loved playing him. He kind of made me a better man because he has so much energy. Koalas are traditionally a little bit more low-key but Blinky is a younger, feisty koala. His father’s gone missing so we’ve given him more of a motive, a method to his madness. There was something appealing for me seeing this koala stepping into uncharted territory and trying to make good. Q: What was the most difficult scene to get the Blinky voice just right on? Kwanten: There is the scene where Blinky is probably at his lowest point where he’s revealing to Nutsy that maybe his plan to go out and get his dad was a bit foolish. He misses his dad and he’s sitting there on a ledge by himself and saying how he feels. We hadn’t seen Blinky be that vulnerable so it was nice to have that moment where this carefree, energetic character (has a quiet moment). You want that opportunity to give him that moment. From there he starts to turn things around. 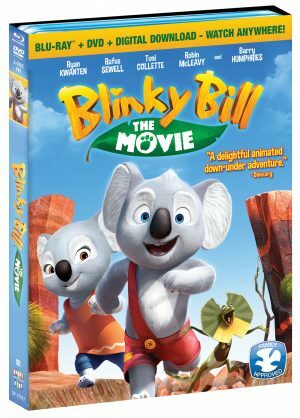 Q: Those who don’t live in Australia probably wonder about some of the unique animals in this Blinky Bill movie. Does everyone there see emus, frill-necked lizards, wallabies and wombats even in the city? Or just at Taronga Zoo in Sydney? Kwanten: I’ve seen wombats, ekidnas and some of the world’s deadliest creatures. It’s surprising we Australian kids live to be adults but you won’t go to a more fascinating zoo than those in Australia especially for foreigners. It’s an education in itself. It will be good for everyone to see these animals in the movie. Q: Do you ever get together with any of the old “True Blood” cast? Kwanten: I would love to but most of them are happily working. It’s probably been about two and a half years since we wrapped that. So no I haven’t but I try to keep busy, moving around or out camping. Kwanten: I’m actually going back to Australia to do a one-month camping trip around the Blue Mountains. Sort of like our Grand Canyon. Q: What do you hope kids or families will take away from seeing “Blinky Bill: The Movie”? Kwanten: Something as simple as wanting to get out of the house and taking an adventure yourself. There’s such a big, beautiful world out there. To confine ourselves to just a TV or mobile phone seems like a waste. A character like Blinky has adventure in his blood and bones and if an audience can take anything from the film it’s just to get out there and have some fun.